You are probably aware that there are several options how one can get ETH coins: purchase them at one of the multiple exchanges, through mining or earn them through Ethereum faucets. Sounds interesting? 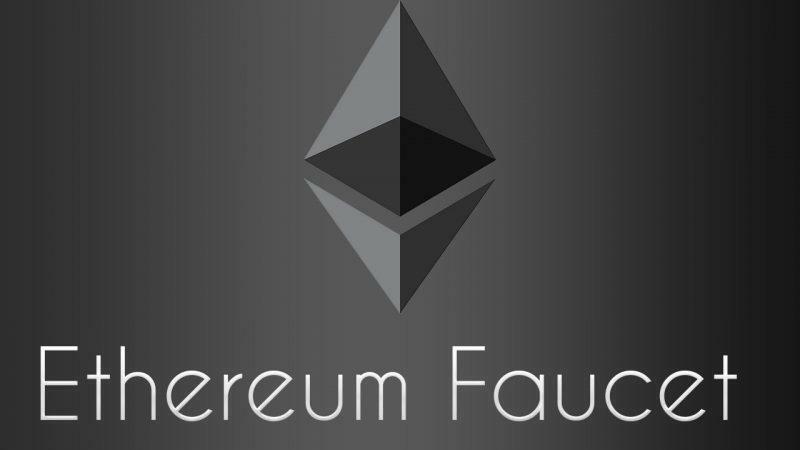 Then keep reading to find out what best Ethereum faucet is, how they work and if it is worth. How to Use Ethereum Faucets? A crypto-faucet is a website that pays you, in cryptocurrencies, for viewing ads and completing captchas. 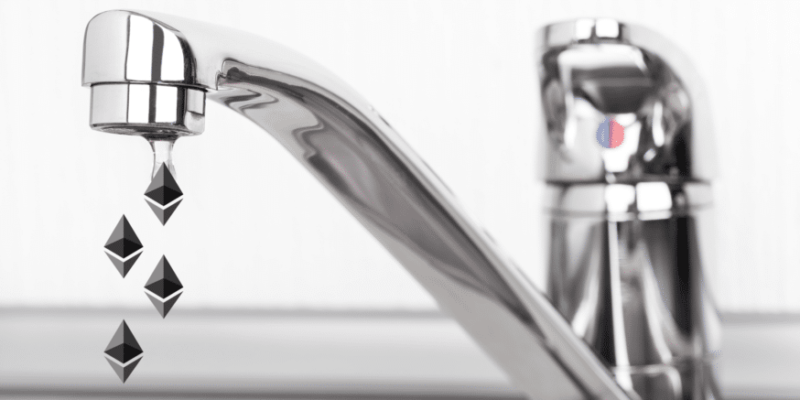 The owners of faucets make money by having a lot of ad impressions which in turn makes them money, or by solving captchas for large companies that need help with automating this task. These platforms will pay Ether instantly to their members for visiting their sites every few minutes. In order to claim the coins, you, as a member, need to solve the captcha to prove you are not a bot or automated program. 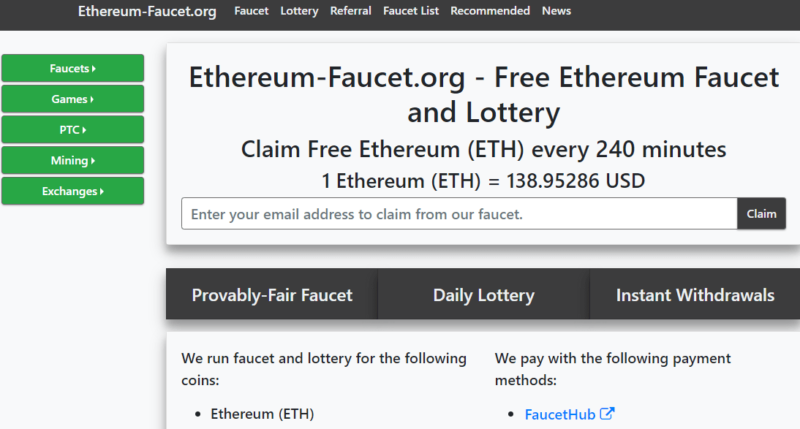 There is a restriction on the number of times a user can claim from the Ethereum Faucet. It can be 5 minutes, 10 minutes, 15 minutes, 30 minutes, 60 minutes etc. 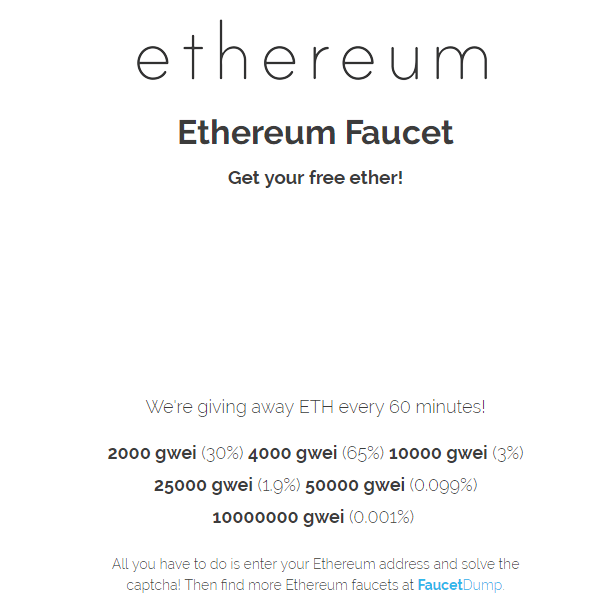 Each faucet allows a user to claim again after the completion of that fixed time gap. To earn more ETH, you would need to work on multiple faucets at the same time, use Ethereum Faucet rotator or should be able to refer more members to the faucets. The amount of ETH you will receive at the end of the day is actually too small to make a difference, even if you decide to go through repetitive mini tasks and aggressive ads. Many of these sites also have a minimum amount of Ether you need to “earn” before you actually receive it. The very first thing you need to do is to set up an Ethereum wallet if you do not have one yet. Select a faucet (e.g. Moon Ethereum Faucet). Turn off the ad blocker within your browser. Enter my ETH wallet address into the faucet. 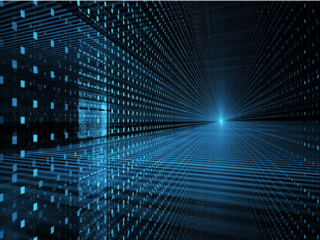 Start solving the captchas and earn the money. Most of websites have a minimum threshold you need to hit before you receive your coins in your wallet. Once you hit the minimum (and it might take you a couple of hours), you can transfer the money to your wallet. 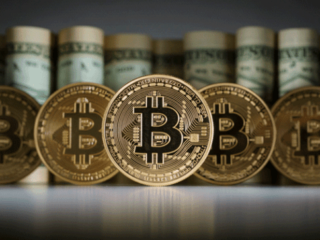 Most of the bitcoin faucets use the micro wallet to pay their members instantly. Receiving payment through the micro wallet has more advantages compared to receiving your earnings directly to your wallet. A micro wallet acts as the middleman between you and the faucet. When you claim your crypto, the dispense will instantly send it to your micro wallet instead of ETH wallet. You can set a threshold limit in your micro wallet account. Your earnings will be automatically sent to your primary Ether wallet once the threshold amount is reached. You don’t need to create an account on the micro wallet, as it will be automatically created for your ETH address once you claim your earnings for the first time through the micro wallet. Link to the wallet will be available on your faucet account. 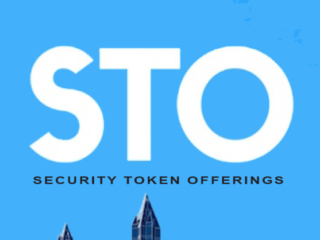 Prevent transaction fees. if the earnings are directly sent to your wallet, you will lose a small amount of money as transaction fees. Your micro wallet will automatically send your coins to your wallet once it reaches threshold limit with zero transaction fees. Reach threshold limit quickly. Since you’re going to claim ETH in several faucets your micro wallet will be filled with coins in no time. So, you will receive a handful of money when it reaches the wallet. Prevent your wallet from becoming messy with transaction details. For every transaction made you will receive a notification and recent transaction will be displayed on your wallet homepage. By making large transactions a few times from micro wallet, make your wallet look tidy. With Ethereum faucets you can earn Ether for free, but that is if you don’t count your own time, or count it as free – which usually isn’t. 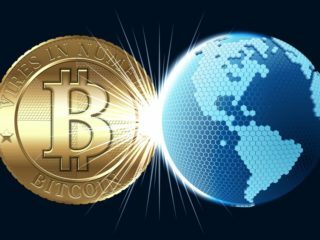 In this case, you may consider using a faucet bot in order to make a more visible profit. Beware that you may expose yourself to various hackers and scammers. 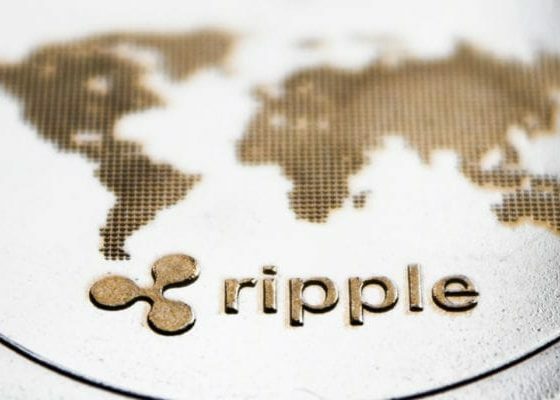 They can send you offers, claiming that they will give you ETH for free, or in exchange for laughably small amounts of other currencies. 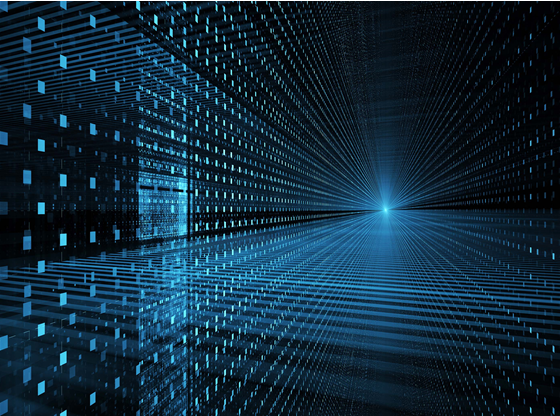 Before a project launches on the Ethereum blockchain (or before changes are made to the blockchain itself), a version is deployed to an Ethereum Test Network (“testnet”), which simulates Ethereum. 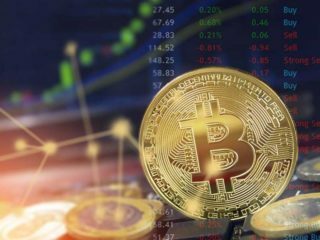 It gives developers and the community a chance to kick the tires before real assets are involved. Ether and tokens on a testnet are easy to obtain, and carry no real-world value — still, it can be fun to own 10,000 Ether or a trillion tokens on a testnet. Ropsten: A proof-of-work blockchain that most closely resembles Ethereum; you can easily mine faux-Ether. Kovan: A proof-of-authority blockchain, started by the Parity team. Ether can’t be mined; it has to be requested. Rinkeby: A proof-of-authority blockchain, started by the Geth team. Ether can’t be mined; it has to be requested. Ethereum-Faucet.org enables you to earn free Ether by solving captchas and participating in a lottery. You can make claims of up to 489 gwei every 240 minutes. With each claim you make you are awarded a free lottery ticket. Users can earn anywhere between 0.005 to 0.015 ETH daily by participating in the lottery. So far, the site has processed over 6 million clams. Instant payments are done through Faucethub micro-wallet. 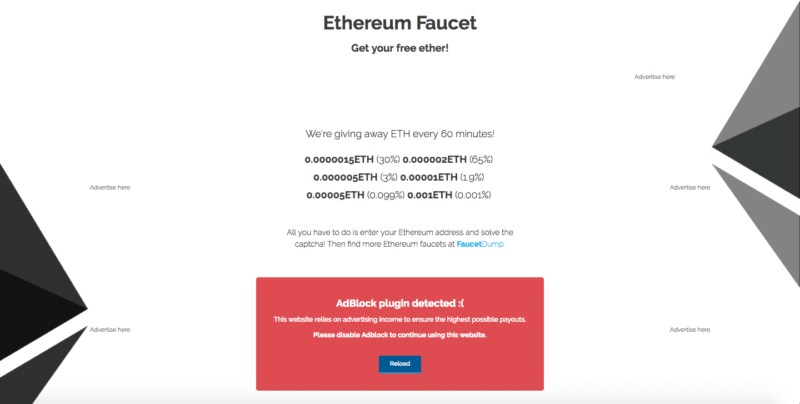 Ethereum Faucet offers you a way to earn free ETH by solving a captcha on the site. Registration is simple since all you need to provide is your Ethereum wallet address. You can make a claim every 60 minutes. According to the site, payouts are made in a tiered system and range from 4,000 – 10,000,000 gwei. In addition, the site has an ETH browser mining option. Allcoins.pw is a free Ethereum faucet that offers miner and auto faucet features as well as a variety of games for you to enjoy. The options are entirely free but you can still deposit crypto if you want to play the games. Allcoins.pw supports over 29 digital assets including ETH and offers a payout of up to 7,430 gwei every five minutes. 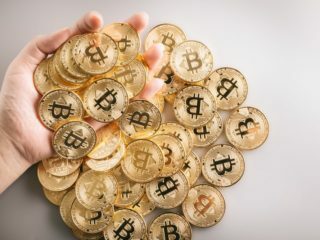 The site also allows you to utilize the multi-option to run auto faucet on up to three different crypto simultaneously. Payouts can be made to your personal Ethereum wallet or a Faucethub micro-wallet. The platform also offers a lifetime referral program which grants you 25% of your referred earnings. Dutchy CORP is a free Ethereum faucet that allows you to earn ETH by solving captchas or playing games. 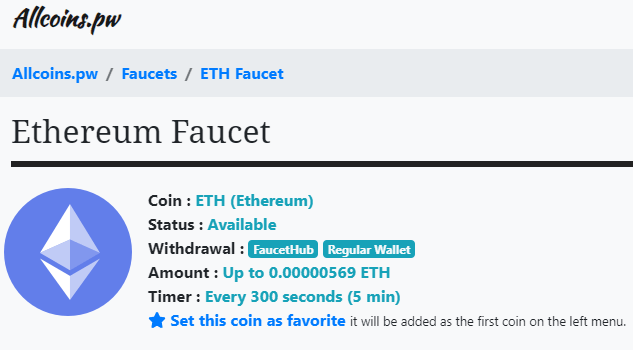 The faucet has a user-friendly UI and offers a variety of digital assets. Furthermore, this Ethereum faucet enables you to make up to 40 daily claims. You stand to make anywhere from 900 to 1,800 gwei when using the auto faucet option. You will receive all your payments in crypto via your Faucethub micro-wallet. 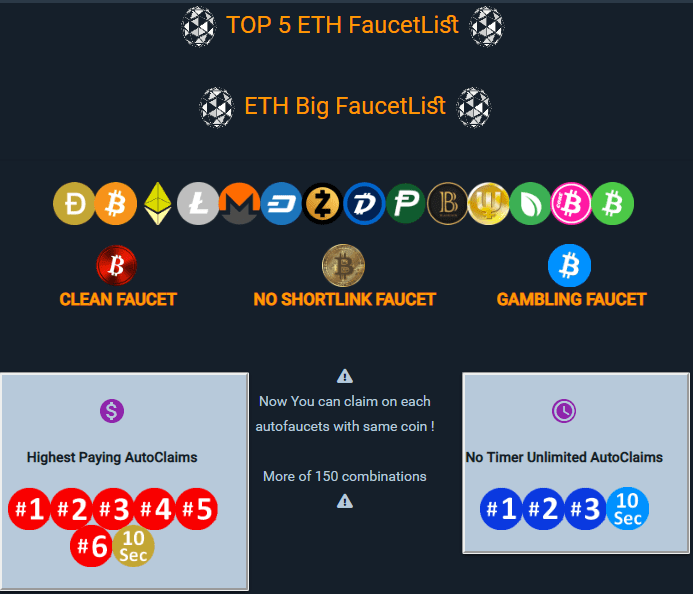 The site also has a weekly bonus reward system for certain faucets and users can run multiple faucets using the auto faucet feature and make claims in ETH. Speedup Faucet is an ETH faucet that allows you to earn Ether by solving captchas or playing dice games. You can claim up to 3402 gwei every ten minutes. 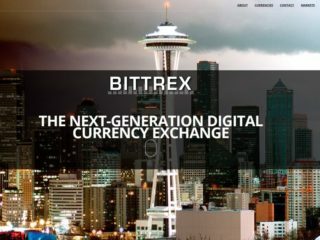 It supports a variety of digital assets including ether (ETH), bitcoin (BTC), dogecoin (DOGE), litecoin (LTC) and more. The site awards the top ten claimers each week with a fixed percentage of cumulative claims throughout the week. Refer another user and receive a 20% referral commission on all their faucet claims! To advertise in EthereumClix, you need to Register a Free Account, log in to your account, click Advertise on the menu and choose advertising packs that suit you best. The minimum payout is 3500 Szabo or same as 0.0035 ETH and you must wait 1 to 72 hours to receive your payment request. 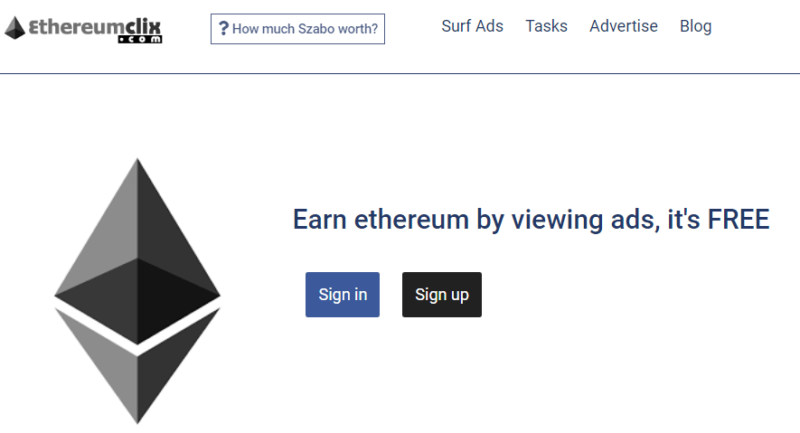 If you invite users to EthereumClix through your referral link, you will earn commission from their earning of clicking advertisements. Referral commission is 50%. You can have unlimited referrals as Free member or Upgraded member. 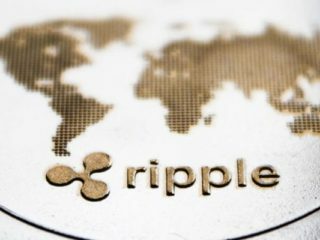 Ethereum faucets are generally a good way to earn crypto without the hassle of investing your own money. As such the payouts are relatively small and it will take some time for you to earn significant amounts. However, it’s pretty clear that almost any other job would generate you more than $0.5-1 per hour without exposing you to extra risks.